Taken on September 20, 1932 during the construction of the RCA Building (later renamed the GE Building in 1986), which forms part of Rockefeller Center in NYC. The image of the 11 construction workers perched on a beam 69 floors above Manhattan eating lunch is one of the world’s most reproduced. 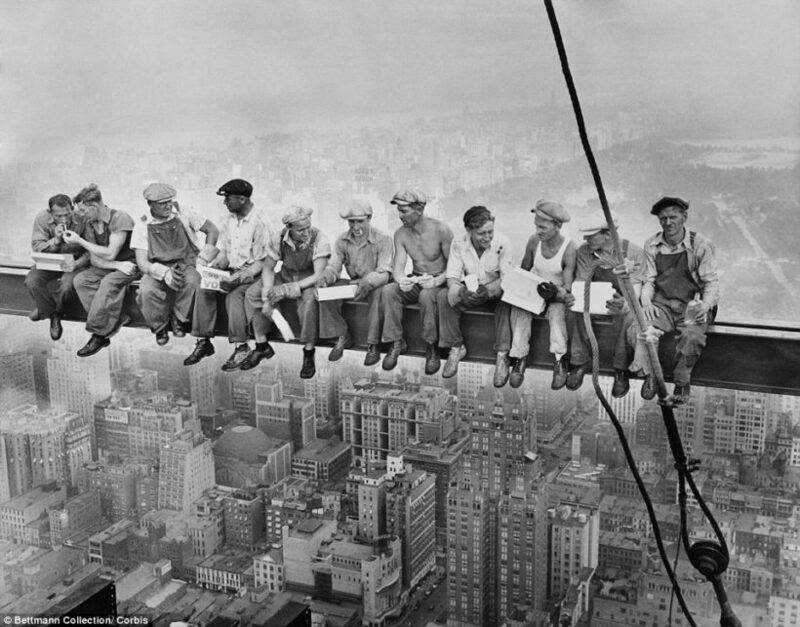 (Archivists say the shot showing the workers enjoying their break on a suspended beam was in fact a publicity stunt. Although the models were real workers, the moment was staged by the Rockefeller Center to promote their new skyscraper. (by Laura Kusisto, The Wall Street Journal) – New York’s construction unions are suffering big losses in market share, as one of the country’s last strongholds for organized labor has started cracking. The city’s largest construction firms are declining to renew collective bargaining agreements with unions, opening the door for more nonunion workers and sending the clearest signal yet that once-mighty construction trade groups are losing their grip on private-sector construction work. At least half a dozen of New York’s largest firms, including major players such as Tishman Construction, Turner Construction Co. and Plaza Construction, in recent months have declined to sign agreements promising to use only union labor on everything from high-rise residential projects to retail, hospital, office and hotel construction, according to people familiar with the matter. The moves allow the companies to begin using nonunion workers, who tend to accept lower wages and benefits and are subject to fewer [labor union] restrictions, on projects across the city. A spokeswoman for Plaza said it “has a long history of working with unions and has no comment on past or future collective bargaining negotiations.” A spokesman for Tishman declined to comment. A spokesman for Turner confirmed that it declined to sign an agreement with the city carpenters union. Other cities are seeing a pullback from union labor as well. In Chicago, labor leaders say they have lost market share in the single-family residential [houses] market and are concerned nonunion firms could encroach more on large apartment and office-construction projects. New York City’s construction unions have been among the last bastions of strength for organized labor, which peaked in influence during the 1950s with a market share of about 35% of the private sector U.S. labor force, according to Jake Rosenfeld, a sociologist at Washington University in St. Louis. The construction industry was even more heavily dominated by unions, with more than half of construction workers carrying memberships in the 1950s. The unions remained powerful during the next three decades in Democrat-run cities such as New York, Boston and Chicago thanks in part to the complexity of high-rise construction and a favorable political climate. As recently as the 1980s, New York developers said virtually all residential projects built in the city used union labor exclusively [100% union workers]. Union leaders say that about half of residential projects in the city are done using their workers exclusively. Even amid a new real-estate boom, some trades haven’t seen their work completely rebound. For example, the New York City and Vicinity District Council of Carpenters—the city’s largest construction trade group— worked about 24 million hours in the fiscal year that ended in June 2008, according to a person familiar with the matter. In the fiscal year that ended in June 2015 they worked about 21 million hours, a 13% decline from the last peak. A spokeswoman for the union, which claims 20,000 members, said its work in the most recent fiscal year increased 1.6 million hours from the previous year, demonstrating they are continuing to gain work. In most cases, construction firms aren’t eschewing [avoiding using] union workers altogether, but rather are using a mixture of union and nonunion laborers known as “open shop.” In New York, developers say that using solely union workers increases costs by about 20% to 30% compared with open-shop arrangements. A study in January by the Independent Budget Office, a nonpartisan city research agency, found that paying union wages on affordable-housing developments increased costs by 23%. Unions say their members continue to perform work that is safer and faster than their competitors, and many developers agree. Nonunion firms won more projects during the downturn, when developers were strapped, and those firms developed expertise on increasingly complex building projects. Gary LaBarbera, president of the Building and Construction Trades Council, an umbrella group for the city’s construction unions, said delays in signing the agreements is part of the negotiating process and many of these firms are continuing to use union workers. “There’s this perception that the sky is falling. It’s not the case,” he said. But competition is heating up. A group of seven open-shop construction firms, which collectively had more than $1.5 billion worth of revenue in 2015, is set to announce it has formed an alliance designed to compete with the unions’ media and political advocacy. 1. CHALLENGE: Define the following as used in the article. 2. What have several of NYC’s largest construction companies declined to do in recent years? 3. a) How will this decision affect union workers? b) How will this affect those workers who are not in a union? 4. How does the president of Lend Lease, the 5th largest contractor in New York City explain his company’s reason for this decision? 5. a) How does only using union sub-contractors (carpenters, electricians, plumbers, steel-workers, etc.) affect building costs, according to developers? b) and according to a study by the Independent Budget Office? c) Who do you think pays those costs? 6. What did the Contractors’ Association of Greater NY ask the carpenters union to do last June? b) After the asked for reduction, how would union workers’ salaries have compared to nonunion workers? 7. From para. 16: “Unions say their members continue to perform work that is safer and faster than their competitors, and many developers agree.” If so, do you think developers should use a both union and nonunion workers? Explain your answer. Developers and construction executives say the unions are falling further behind the times. Strict rules about which workers can perform specific tasks have been slow to change with advances in technology, although union leaders say they are taking more steps to adapt. Developer David Kramer said what drives him crazy is refrigerators. On a nonunion project, he said, he orders refrigerators from the local appliance store, which brings the fridges up to the apartment, installs them and takes away the boxes for free. On a union project he has to pay the mechanical subcontractors to do the same task, adding $100,000 to the construction costs. Gary LaBarbera (president of the Building and Construction Trades Council, an umbrella group for the city’s construction unions) said such cost savings are often outweighed by inferior quality or delays in completing projects. “I’d love nothing more than to work with a union contractor that’s quality and at the right price,” said Mr. Kramer.